Students meet with non-profit organizations at the Meharry-Vanderbilt Alliance to discuss plans for the IPE Student Project. NASHVILLE, Tenn. 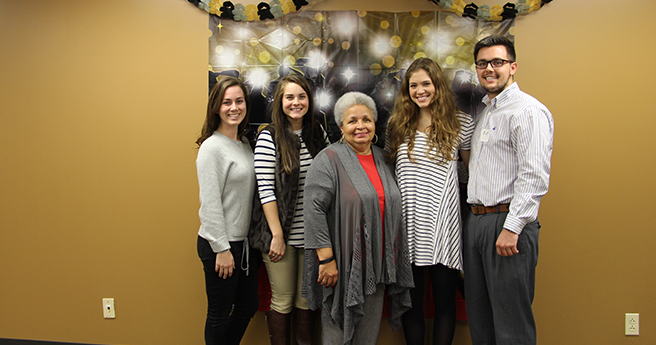 The Interprofessional Education (IPE) Student Project is a collaborative effort between academia and the community. 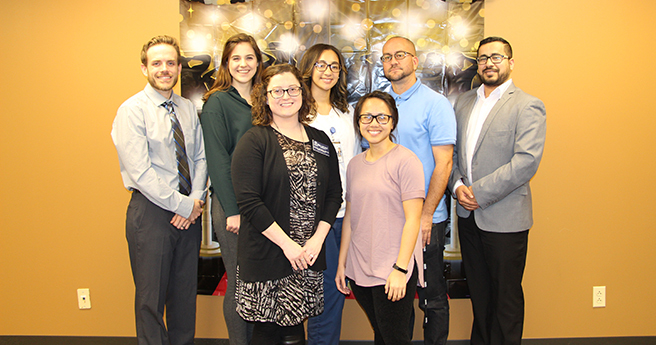 Students in the healthcare field work together with non-profit organizations with the goal of bettering their community. “Guided by our partnering community organizations, a team of professionally diverse students will create and implement plans of action to address community-defined needs,” Prather said. St. Luke’s educates, enriches and empowers the community through meaningful collaboration and quality service. Urban Housing Solutions’ mission is to provide affordable housing for people with unique housing needs and to eliminate packets of poverty within Nashville’s neighborhoods. The mission of Dismas House is to bring about mutual reconciliation between former offenders and society through the development of a supportive community. The Oasis Center provides comprehensive admissions and financial aid expertise to support and increase students’ college acceptance rates, retention and successful degree completion. Rachel Zandee (Belmont), Monia Walsh (Lipscomb), Neysa Badili (St. Luke's Community House), Elisa McGinnis (Belmont), and Matthew Bidwell (Meharry). Not pictured: Jacinta Leavell (Meharry) and Gerald Davis (Meharry). 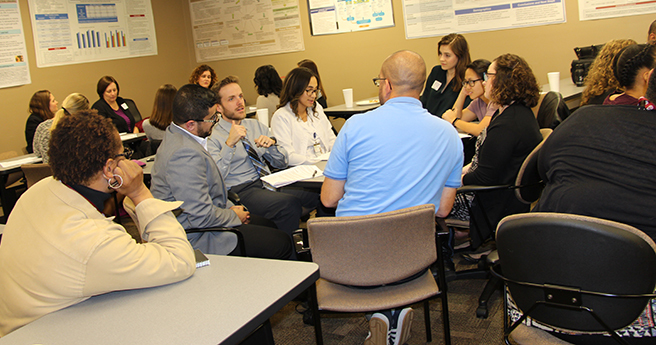 Students from Vanderbilt University (VU), Belmont University, Lipscomb University, Tennessee State University (TSU) and Meharry Medical College (MMC) gathered at the MVA for the first time on October 26, 2017. “The first session was an overview,” Prather said. After going over the MVA and the upcoming project, each student took the Myers Briggs personality test – which indicates differing psychological preferences in how people perceive the world – and joined their respective groups. “We discussed personality traits, how they could work through that and what people’s strengths and weaknesses were,” Prather said. 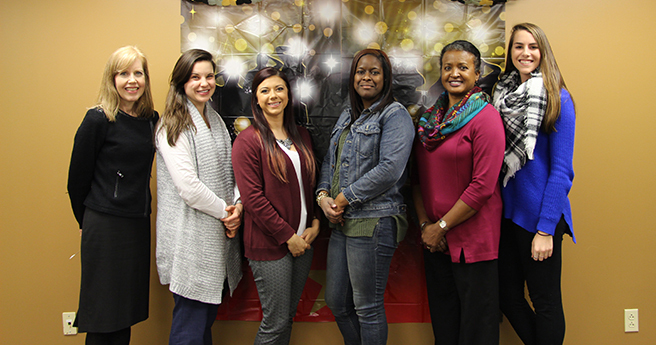 Elizabeth Robinson (Vanderbilt), Haleigh Hemond (Vanderbilt), Shawna McAdams (Lipscomb), Tiffany Davis (Urban Housing Solutions) Karon Uzzell-Baggett (Belmont) and Lucy Mourtin (Vanderbilt). Not pictured: Amy Turner (Vanderbilt) and Christian Ketel (Vanderbilt). “In the second session, the students pitched their team to the Community Partners, and the Community Partners evaluated the pitch and provided comments,” Prather explained. Students reviewed each community partner’s mission, goals and history. 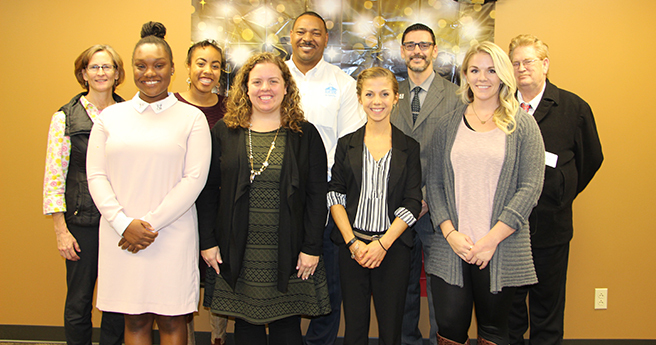 Carey Szetela (Meharry), Jerisha Caudle (TSU), Shannon Davies (Vanderbilt), Maria Papadoponlos (Belmont), Gerald Brown (Dismas House), Katelyn Fougere (Vanderbilt), Todd Gilpin (Dismas House), Julie Simpkins (Belmont) and Jay Hedgepeth (TSU). Not pictured: Christian Ketel (Vanderbilt) and Sasha Curry (Meharry). The third session involved the Zoom Game, which was based on the “Zoom” picture books that contain sequential pictures within pictures. Each person received an image but was not permitted to show it to anyone else. Together, each team figured out the correct sequence. The activity focused on effective communication and problem-solving skills. 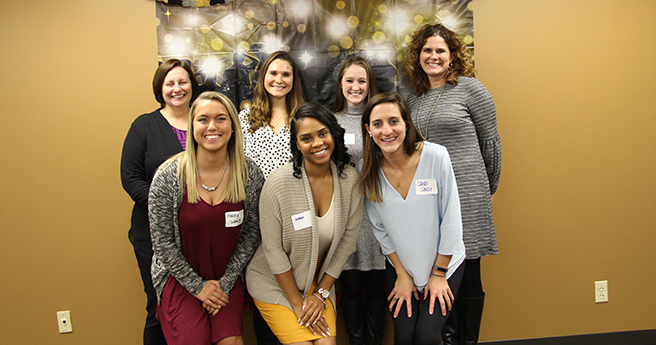 Missy Bryan (Belmont), Haley Ward (Belmont), Natalya Richardson (Vanderbilt), Jordan Douglas (Meharry), Nora Adams (Vanderbilt), Sarah Saussy (Vanderbilt) and Corey Gephart (St. Luke's Community House). Not pictured: Samuel Starks (Lipscomb) and Barbara Jacobson (Vanderbilt). “Our final session of the year (November 16, 2017) was the reveal,” Prather said. At an event resembling a Golden Globes award ceremony, the Community Partners attended and received envelopes containing the names of their team inside. Flanked with streamers and Hollywood decorations, they announced the pairings. Two teams will work with St. Luke’s – one with the Seniors’ Program and one with the Children’s Program – while the remaining Community Partners will each work with one team. Students working with Urban Housing Solutions will focus on contributing to health outcomes for vulnerable residents through a deliverable that will include low-cost and healthy recipes, converting leftovers into multiple meal options and maximizing a food budget. St. Luke’s Community House has two programs – a Senior Program and a Children’s Program – that will participate. The student team paired with the Senior Program will build upon the resource guide created by the last IPE student team, explaining how certain healthy foods can supply necessary nutrients and outlining easy exercise activities to maintain a healthy life. The team with the Children’s Program will create a deliverable for parents to educate their children about dental care. Students working with the Oasis Center will create a deliverable about career opportunities and the academic skills necessary to be successful in those careers. Students working with Dismas House will develop a program that helps with prevention of incarceration. With the glitz and glam out of the way, the teams made preparations for the work ahead. Their next assigned meetings would be held at the MVA starting January 25, 2018, and continue through March 22. Ultimately, the teams will prepare a presentation and create a deliverable aimed at benefiting the health and wellbeing of the community.